Iain MacColl, Screen Machine operator and driver for the past 21 years and is to receive a BAFTA on Sunday. The Screen Machine’s founding operator and driver will emerge from the shadows of the projection room to take a starring role at Sunday’s British Academy Film Awards (Bafta) at the Royal Albert Hall. Iain MacColl, 65, is a well-known face the length and breadth of the Highlands and Islands as he clocks up hundreds of miles in the iconic blue and white pantechnicon bringing blockbusters and arthouse films to more than 40 communities. He will step into the showbiz limelight as winner of the first ever Bafta and EE’s UK-wide ‘For the Love of Film’ competition. People across the UK were asked to submit applications for the new award on behalf of someone they felt should be recognised for their contribution to film. A panel of industry experts chaired by Andrew Orr of Bafta sifted through hundreds of applications. From Tomintoul in the east, to Brodick in the south, South Uist in the west and Westray in the north, the massive lorry has clocked up 233,000 miles in the past 14 years. 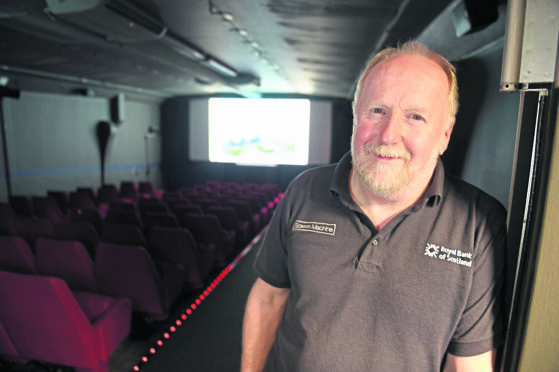 Funded by Creative Scotland, Highlands & Islands Enterprise and box office takings, the 60ft lorry converts into a raked, 80-seat, air-conditioned auditorium. The operators do everything including driving, selling the tickets and welcoming visitors. The Screen Machine is in its 21st year and now has more than 30,000 visitors annually. Mr MacColl has been with the service since the start. Over the years he has taken the Screen Machine to the G8 summit at Gleneagles and twice to Bosnia. He said of his award: “Who would have guessed this wee guy from Tighnabruaich would be going up the red carpet at the Albert Hall? Mr MacColl has been known to dress up Abba-style for screenings of Mamma Mia! and to hand out kitchen roll at the end of a weepie, as in A Star is Born recently. Mr MacColl travels to the Savoy Hotel, London with his wife Liz on Saturday, and will get the hair and make-up Hollywood treatment prior to walking the walk up the red carpet to the Albert Hall in his kilt. The ceremony will presented by Joanna Lumley and broadcast around the world on Sunday. Dan Ellis who founded the social enterprise Jam Jar Cinema in Whitley Bay also receives a For the Love of Film award.